Most local businesses have a low ceiling on the amount of money they spend on advertising so search-engine-marketing (SEM) agencies need to find more efficient ways to manage a larger portfolio of accounts if they are going to achieve the scale necessary to drive profits. Currently we estimate the average salesperson manages about 20 to 25 accounts at a typical local SEM company. 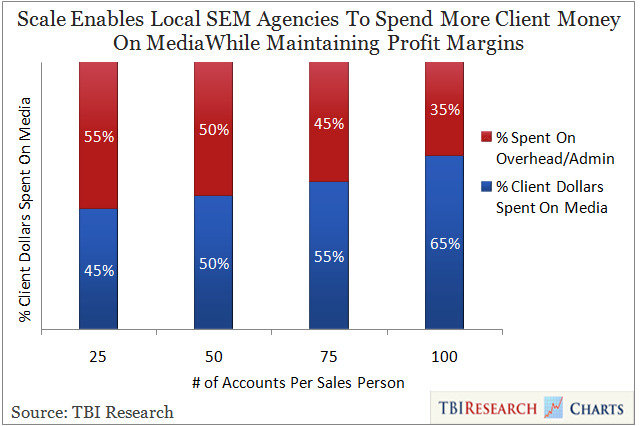 The General and Administrative expenses associated with managing these accounts are largely fixed so more of the client’s spend can be allocated to the media buy if salespeople are able to effectively manage more accounts simultaneously. We estimate that local SEM companies that can effectively manage more accounts per salesperson can spend more on media for their clients, improve client satisfaction, and ultimately grow profit margins.